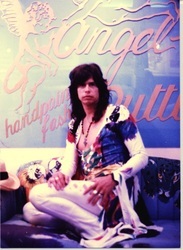 I hand-painted this outfit for Steven Tyler of Aerosmith while he and the band were recording a new album in Vancouver. Here I am with Steven Tyler when he came to pick up the jumpsuit I painted for him, which he wore every night on Aerosmith’s Permanant Vacation tour. This entry was posted in Uncategorized and tagged Angel Handpainted Fashion, Angel of Vancouver B.C., Desigual, Rare version of Angel by Steven Tyler and Aerosmith, Steven Tyler meets Angel in Vancouver, Steven Tyler of Aerosmith. Bookmark the permalink.